Well, it’s happening again. 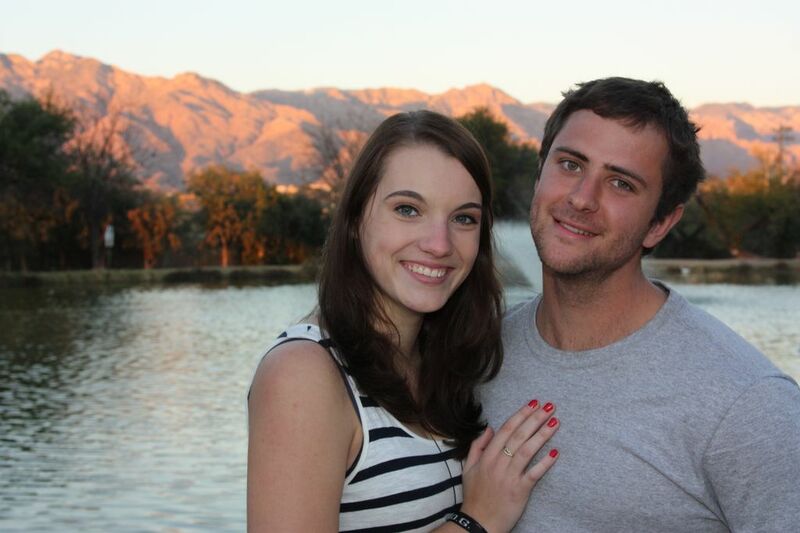 My son, who I introduced to you all a year ago (see That’s My Boy, Jan. 2012), is getting married. His relationship with a German girl, Julia, vexed by the daunting obstacles of both distance and finance, somehow endured and is blossoming into permanence. Sam’s genetic predisposition towards faithfulness and resolve (thank you, God, for recessive genes) has served him well, and his reward is a prize beyond measure. The couple met in the summer of 2010, when Sam and a friend spent almost four months lost in Europe. There they met up with a friend from Tucson, who had been a German exchange student here; she invited them to her church in Berlin, where he met Julia – the Pastor’s daughter, no less. When Sam went to Europe, my wife and I were more concerned with him losing his passport, getting shanked in a Rome alleyway, having his wallet picked by a less than choosy gypsy, or hopping on a wrong flight and ending up in Calcutta with no money. It never occurred to us that he might find the love of his life there, and we couldn’t be happier. She is a bright, cheerful, beautiful and engaging young lady; just like his father, some twenty-five years before him, Sam has chosen wisely. Also, like his father, he could not have done better for himself. How else are we alike, you ask? (Maybe you didn’t, but you should have – how rude of you). Well, he has my devastatingly good looks (clearly, he stole them from me, since I haven’t had them for a very long time); my sense of humor (many would argue that he stole that from me as well); and a consistent and very peculiar listing of the head whenever our pictures are taken. (See above). All of the other qualities – the ones that make him a great son, a strong and supportive friend, a fiercely loyal and loving partner – he got from watching television his mother. Know what? I’m okay with that. So, in a little more than two weeks, I’m proud to say that my son will be a married man. Why no fear, no hesitance, no sense of dread on my part this time? Well, for one thing, he is my son; the last wedding involved my oldest daughter, and the idea of some guy (though, admittedly, a really, really good guy) putting his mitts on and worse, cohabitating with my precious, beautiful girl, was a little disconcerting. But because He’s my son, the idea of Sam putting his mitts on and cohabitating with someone else’s precious, beautiful girl actually makes me kind of proud. Admittedly, it’s not fair, but if you’re a dad you get it. The real reason I anxiously await this wedding, though, is this: two people, separated by six thousand miles of land and ocean, met by chance, quite briefly, and each were intrigued enough to cross that considerable span no less than six times combined to test the resiliency of their relationship. To all that know them, one thing is clear: this is a union planned, nurtured and ordained by God. There’s a flurry of activity as the date approaches. There was some concern that Julia might not get her permanent visa in time to make the date, but God has made certain she will be here in time. My wife has dealt with much of the arrangements in her absence; I have handled the considerable accompanying stress (strangely, I am only associatively affected) with knowing nods and timely shakes of the head. It’s going to be an amazing day; God, who is in control, will make it so. My only son, of whom I am infinitely proud, and who I love as much as I am able, is marrying a beautiful and incredible woman. My daughters are just as dear to me as he; they are more precious than anything man can claim as such. Now, with Julia joining our family, my wife and I are blessed with another. So, on July 27, offer a prayer if you’re so inclined, or simply remember that on that day, in a time where tragedy, sadness and despair increasingly take center stage, an event that relatively few will see, but one that exemplifies at least some of what is right with the world will take place, and I get to be there for it. This entry was posted in Children, Christianity, Family, Humor, Life, Living, Marriage, Uncategorized, Weddings and tagged Children, Christianity, family, humor, Life, Living, Marriage, Parenting, Weddings. Bookmark the permalink. 13 Responses to Wedding Bells are Clanking – Again! Thank you! It is wonderful, and we are blessed! Awwwww, Richard you’ve done it again. There is sweetness beneath that crusty exterior. A wonderful tribute to Julia and Sam. Looking forward to the day of celebration. By “crusty exterior” did you mean the dried chili down the front of my shirt? Thanks, S.I.L. Can’t wait to see you! Very nice. Funny how some things happen, isn’t it? Indeed! The world is full of surprises; occasionally good, like this one! Absolutely! Congrats on that, by the way! Which, in turn, makes me very happy! Another beautiful tribute from one of the world’s great Dad’s! Not sure how great a dad I am, but I sure do love my kids. Thanks for saying that!